The photo that heads this page was reprinted from Marlin Magazine, which used it to illustrate an excellent piece on the subject that can still be found online with a simple internet search. Almost everyone has their own ideas on this topic. When targeting blue marlin, some of the skippers I've fished with wouldn't bother to go out during the day - no matter how good the weather - if there was a full moon up all night. They believed that during a cloudless night around the full moon, the big fish could see all the bait highlighted against the bright sky from below, so they ate all night and were so full come morning that they just cruised around most of the day with no appetite and little interested in lures, bait, or whatever. And because this is game fishing, just as many others swear by exactly the opposite approach. Still others insist that the different species of marlin behave differently during moon phases. The anecdotal evidence seems to imply, and some game fishing writers agree, that the half moon is generally believed to be one of the most productive times for marlin, but forget about any hot bite during the week of the full moon, generally from about three days before to four days after. The first summary by highly respected marine biologist and game fish guru Dr. Julian Pepperell takes a look at the facts that emerged from a detailed study of Great Barrier Reef black marlin game fishing records that helps shed some light on where the myths and where this piece of research stand in this matter. The second article below is the detailed paper authored by Robert Campbell, Julian Pepperell, and Timothy Davis which contains the detailed analysis of the data and its conclusions in scientific terms. The third article is a parallel piece - not specifically dealing with moon phase - published by NSW DPI that may also be of interest. 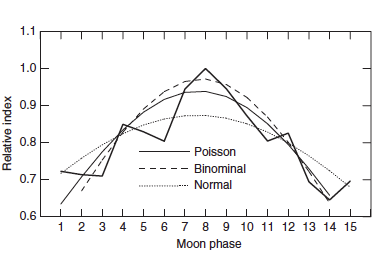 The critical centrepiece of the marlin and moon phase analysis is however, the graph I've reproduced immediately below, who shows the available bite data against moon phase. The message here is that the best bite is during the half moon (Phase 8 on the graph), and the worst is within a day of the full moon (Phase 15 on the graph). Again, it should be noted that this study is based on black marlin records from the Barrier Reef, and while it can't necessarily be rigidly superimposed on a different species and a different geographic location - for example, the blue marlin fishery on the northern NSW coast - it's the best we've got, and many of us fishing the Solitary Coast believe there's a very strong correlation. Read on... there's plenty here to absorb.